When doing a budget the traditional approach is to take last year’s budget and increase expenses by say 6%. The ABC Focus approach is to look at the activity outcomes you wish to achieve and work the budget back from that. For example if the business wishes to do more of something its currently doing then what cost increases must be budgeted for to enable that to happen. 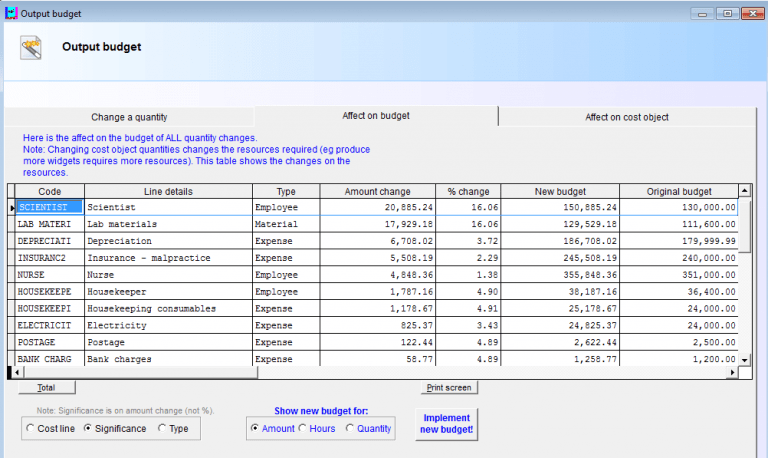 With output budgeting you can see the effect on the budget and cost objects when quantities change. ABC Focus is an output budgeting tool which enables activities and their cost drivers to be identified and measured. It identifies costs associated with the different sections of the business where particular activities occur and alerts management to areas of activity with below optimal functionality where better outcomes may be possible with resource adjustments. In the image below an increase in the quantity of blood tests performed in the next budget period is required. An increases from the current 12,200 units to 15000 units is being tested to see what budget changes will be necessary to accomplish this. If the quantity of a cost object is changed the associated resources will also change. Here you can see the costs for the individual resources that currently support the activity and the new budget costs that will be necessary to achieve the desired increase in activity. Output based budgeting is part of the Gold version of ABC Focus activity based costing software.